Buttevant (Irish: Cill na Mullach, meaning "Church of the Summits" or Ecclesia Tumulorum in the Latin) is a medieval market town, incorporated by charter of Edward III, situated in North County Cork, Ireland. While there may be reason to suggest that the town may occupy the site of an earlier settlement of the Donegans, Carrig Donegan, the origins of the present town are clearly and distinctly Norman, and closely connected with the settlement of the Barrys from the 13th century. Buttevant Castle, locally also known as Barry Castle, lies on the edge of the town. Buttecant Castle was built around 1200 by the Norman Barry family. It was built at the edge of the town, on a hill above the swift-flowing Awbeg River, overlooking the town's mill and weir. In 1317 the town was enclosed with a strong wall and the castle became part of the town's defenses. In 1461, a Morrogh O'Brien over-ran the province of Munster, and damaged or took the town and castle of Buttevant. In 1555 Lord Barry was created Viscount Buttevant. 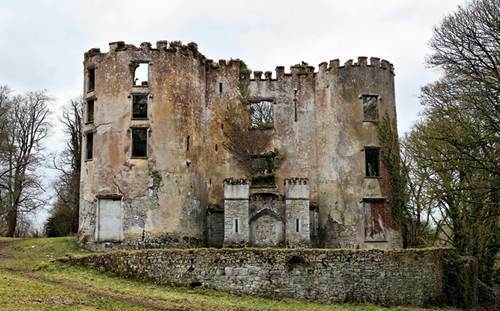 In 1790, Buttevant Castle and town were sold by Richard Barry, Earl of Barrymore, to a John Anderson of Fermoy. He restored the castle as a castellated house and gave it to his eldest son Sir James Anderson. Sir James lived there until the mid-1840s. In 1850, the castle was occupied by a William Roche. The castle had various occupants in the later 19th century and was last occupied in the early 20th century.